To delay for one year a requirement that annual year-end evaluation ratings of classroom teachers be 40 percent based on student growth and assessment data (state-administered tests), with the rest of the evaluation based on more subjective factors determined by local school administrators. Under current law this standard would go into effect for the 2018-2019 school year. This law's requirement that 50 percent of the teacher evaluation be based on student test results in “core content areas” would remain. To authorize a Kiwanis Club specialty license plate, with the net revenue from its sale going to the Kiwanis Club. To revise the law that bans dogfighting to include “any other thing of value” in the definition of ill-gotten gains and revenue derived from dog fighting. This is part of a legislative package comprised of House Bills 4102 to 4107 that adds “cryptocurrency” to the definition of money in various criminal statutes. To revise details of a 2018 law establishing the definition of an “applicant” for a marijuana business license. 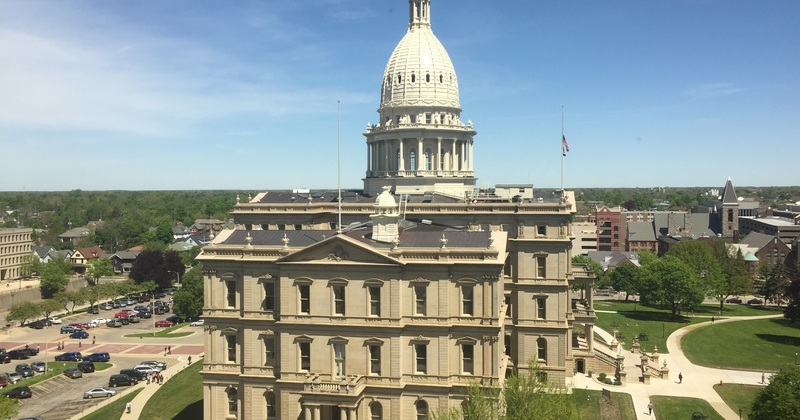 The bill would specify that applicants include a company's manager and officers, partners, directors and stockholders who own at least 10 percent, and their spouses. Applicants are subject to an extensive background check process. To establish a hospice exception from a law that prohibits prescribers who do not have a “bona fide prescriber-patient relationship" from prescribing controlled substance painkillers. This requirement otherwise requires a medical service provider to have reviewed a patient’s relevant medical records, and completed a full medical history and current condition assessment including an examination. The exception is intended to let hospice care providers adjust medication to the meet serious and rapidly changing needs of a dying individual.